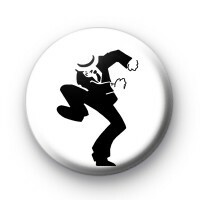 Black and white Ska dancer button badge inspired by Madness and Ska music. If you love to skank this is the perfect badge. Standard 25mm button badge hand made in our UK workshop using metal badge components with a copper pin back.